Lining up outside the Clonmel Control on the second stage. Smith's NSU (No4) led it's class until exhaust manifold trouble set in. Reprinted from the April 24 1963 edition of “The Motor” magazine. 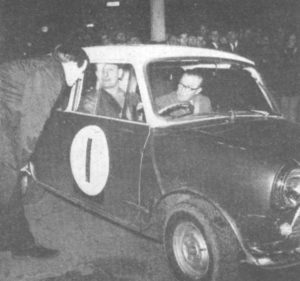 THE 1963 International Circuit of Ireland Rally held over the Easter week-end was won by two young Ulstermen, Ian Woodside and Esler Crawford, driving a supercharged Austin-Healey Sprite entered by the Alexander Engineering Co. At the end of the 1,500-mile event, organized by the Ulster A.C. and sponsored by Lombank, they had 15.3 marks to spare over another Co. Antrim pair, Robin McBurney and John Surgenor, in a modiﬁed Volkswagen 1200. Third place went to the 1960 winners, Adrian Boyd and Maurice Johnston, in a factory-entered Sunbeam Rapier. To give the leaderboard a “family” appearance, Woodside’s brother Robert took fifth place behind Cecil Molyneaux with a Morris-Cooper, and Boyd’s brother Derek was eighth. The Ladies’ Prize went to Rosemary Smith and Sheila O’Clery in another works Rapier; they also teamed with the Boyd/Johnston car and one driven by John la Trobe and J. Chitty to win the one-make Team Prize for Sunbeam. THIS year’s rally started at Bangor, near Belfast. at midnight on Good Friday, and finished on the following Tuesday afternoon at Larne on the opposite side of Belfast Lough. From start to finish there were 35 controls, 89 time checks, seven route checks, seven optional checks, eight driving tests, seven special sections and seven speed tests, all of them either hill-climbs or descents. Unlike in previous years the event fell much more into line with international rally standards, and the emphasis was taken off the driving tests and put squarely on the road sections. Three times Circuit winner Robin McKinney, now Clerk of the Course, gives last minute advice to J. Moore and R. Tilson who led the field away. The marking system for the tests and speed events was based on the difference between the best in each class and each individual time in the same class. In some of the longer speed events the marks were then divided by a factor to reduce any big advantages. Special section losses were assessed at one mark per five seconds over the allowance and road minutes were charged at two marks each, whether at controls or time cheeks. 1. I. Woodside (Austin-Healey Sprite s/c) 8.6 marks lost. survivors in the big saloon class. Another “Tulip” section with two checks in 37 miles led from Malahide in a big circle around Dublin. From Stone Cross. in the Dublin mountains. followed a tight 40-mile navigation section which caught many napping at a ford in the Glen of Imaal. Several clean sheets were lost when drivers turned back rather than cross the swollen river. Amongst those who went through were Pauline Mayman and Valerie Domleo in their Cooper. The big saloon class dwindled to one here when Bertie McElhinney in another Zephyr broke a crown wheel, leaving Kennerley’s Jaguar as potential outright winner merely by maintaining a clean sheet. He would automatically set up the best time of his class in the tests. However this position did not arise as he lost over 300 marks before arriving in Killarney at the end of the stage. 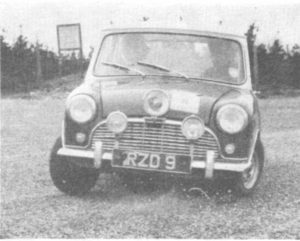 The second driving test followed at the television transmitter on Mount Leinster in Co. Carlow, where Ian Woodside set up best time, and was closely followed by his brother again. Followed by more navigation in the Kilkenny and County Waterford areas, the course then led to the Punchbowl Mountain near Clonmel, Co Tipperary, where the second hill-climb took place on a short portion of hill with two sharp hairpins. From the Punchbowl the route to the first overnight stop at Killarney consisted of four hours of fairly easy navigation. Four miles from the Killarney control there was a secret cheek and several of the competitors were caught for a full 300 marks for exceeding 40 m.p.h. Amongst them were the Kennerley Jaguar, the Saab of Malcolm Templeton and D.R. Lockyear, and the Mayman/Domleo Cooper. The Class 1 leader, Noel Smith, arrived at the control minus windscreen in his NSU Prinz which had been smashed 50 miles back. He was unable to gel a replacement for the NSU Prinz before checking in. Having secured one overnight the replacement was completed in three minutes after checking out the following morning. The overall position at the end of this stage showed that Peter Johnston, navigated by his wife, had moved up into second place behind Ian Woodside who had not lost a single mark all day. Adrian Boyd was still third and Ronnie McCartney in another Alexander Cooper was fourth. 6. R.D. McBurney (VW) 21.2. The 200-mile Sunday drive started and finished at Killarney and included some very difficult navigation in the Kerry and West Cork area. Very heavy rain made conditions extremely difficult, and there were very few clean sheets at the end of the day. The first break in the morning was for a timed descent of the Healy Pass over three miles long with its 45 twists and turns. Best time was set up by Roger Clark with his Cooper in 3min. l2sec. Next best was A. T. Fisher in the works Reliant. three seconds slower. while A. Boyd (Sunbeam) and Ronnie Adams in the Cortina tied at 3.17.6. Other class bests were set up by Kennerley (of course) and Colin Andrew in the Austin Mini in the small car class. After a driving test at Ballydehob, the real navigation started. A flooded river rendered one of the timepoints impossible, but not before Malcolm Templeton had tried his Saab for sea-worthiness and got ignobly stuck. He lost a stack of marks before the following control, missing eight timepoints, but continued and lost no further road marks that day. Another special section on a one-mile stretch of road near Bantry saw Adrian Boyd the nearest to the allowance, but again nobody covered the distance in 90sec. A third “Tulip” led competitors in a 40—mile loop to Durrus Co. Cork and then they moved to Coomhola Pass for a four mile climb at Borlinn, where Adrian Boyd got the Rapier to the top in 4 min. 38.8 sec., and Cecil Vard took only 1sec. more in his Cooper. Class winners were Colin Andrew (Austin), Roger Clark (Austin-Cooper), Boyd, Kennerley, Vard and lan Woodside. At the end of this stage the overall positions became a little vague, as several protests were rumoured and certain sections of the first navigation section were scrubbed on account of the ford. J.A. Eakin (Austin) retired after a collision with Roger Clark while he was returning from the river, but Clark was able to continue. J.D. Keatley (Morris-Cooper) had to retire when he was struck by H. McGrillen (Fiat) who was also put out of the hunt. Peter Johnston, second overall, was out with carburettor trouble. The very provisional results showed that Woodside had a narrow lead over Boyd, with Charles Eyre Maunsell (Sunbeam Alpine) in third place and Cecil Vard the best of the southerners in fourth position. Although these were later altered, the changes did not affect the top positions. Stage Four included a hill-climb near Limerick and another at Lake Nafooey in the heart of Connemara in Co. Galway. Sensation followed sensation on this stage. Woodside had a ﬁre under the bonnet at the top of the Limerick climb and R. White in another Sprite came to his assistance and gave him his carbs. He lost 42 marks into the next control near Ennis. Co. Clare. Then came word that Adrian Boyd had knocked pylons in a driving test. So Charles Eyre Maunsell had jumped out into the lead. But not for long. He broke a half-shaft and was out before Nafooey. The official order as cars left Sligo on Stage Five, the long night run, was Boyd, Woodside, R. McBurney, Vard, and Acheson. The night run proved very tricky. but Woodside and Crawford were so determined to get back their lead that they were the only crew to come through clean. Several others. Smith (NSU), Brooks (Vauxhall), Armstrong (Sunbeam), kept their losses down to six marks. But Adrian Boyd had tough luck, getting lost and losing two points at 20 marks apiece and nine minutes as well, dropping him well out of the hunt. Michael Ivis distorting his Austin’s tyres on the Mount Leinster Test. packet during the night and was back in sixth place. After breakfast competitors set off to the finish at Larne where the last test was to be held. There were four special stages en route. and there was a big loss of marks on these. N. Smith’s NSU had some manifold bothers and was forced out while he was lying fifth overall having led the small saloon class from the start. Adrian Boyd set a spanking pace on the stages, and also had best time on the Cairncastle hill-climb. and managed to pull himself back to third place, with a win in his class. McCartney’s Morris-Cooper ran its bearings on the first stage, but although he continued and finished, he dropped from second place to eleventh, and third in his class. Thus finished the 1963 Circuit. Of the 6l entries in the International class, there were 44 finishers which gives some idea of its severity. Running with the International Rally, there was a special Touring Event which attracted 38 entries. who covered a very similar course. which did not include speed tests, special sections nor the more difficult navigation. Nor were the two all-night sections included. The winner of this section was Allie Carroll. a racing veteran, who was navigated in his M.G. Midget by his future son-in-law B. McCance. Second were J. Armstrong and W.R. Robinson in at Morris Minor. Touring Cars up to 850cc: D. Glover/M. Basset (Austin 848) 235.2; M. Ivis/R. Meyer (848 Austin) 272.6; J.S. Moore/R. Tilson (848 Austin) 378.4. Touring Cars 850cc-1300cc: C. Molyneaux/ H. Patton (997 Austin Cooper) 161.5; D.D. Boyd/D.B. Crawford (997 Austin Cooper) 198.9; J.S. McClean/R. English (997 Austin Cooper) 210.0. Touring Cars 1300cc-1600cc: A.J. Boyd/M.N. Johnston (1594 Sunbeam) 135.8; M.B. Day/R. Irwin (1493 Volkswagen) 241.6; J. LaTrobe/J. Chitty (1592 Sunbeam) 249.4. Touring Cars Over 1600cc: J.R. Kennerley/J. Jones (3781 Jaguar) 211.8. Grand Touring Cars up to 1300cc: R.D.G. McBurney/J. Surgenor (1295 Volkswagen) 132.0; R. Woodside/N. Henderson (1122 Morris Cooper) 161.5; C. Vard/D. Reynolds (997 Austin Cooper) 170.3. Grand Touring Cars Over 1300cc: I. Woodside/E. Crawford (980 Austin Healey S/C) 116.7; M. Acheson/J. Long (2138 Triumph) 193.7; A.T. Fisher/R. Crellin (1703 Reliant) 235.7. Open Team Prize: I. Woodside, R. Woodside, D.D. Boyd. Lombank Special Awards: (Next best performance by crews not winning other awards) J.R. McSpadden/J. Armstrong (1493 Volkswagen), E.A. Lucas/A.J. Lucas (1546 Vauxhall), G. McNamara/B. Cusak (1221 Skoda), W.H. Hagan/D. Turkington (948 MG), R.J. McCartney/T. Harryman (997 Morris Cooper).